When 138 senior Muslim scholars and clergy tried to establish the common ground between Islam and Christianity last year, they said the very peace of the world hung on the outcome. On Tuesday, a high-ranking delegation is beginning a rare visit to Rome in an effort to persuade the Pope to endorse what they say are the shared origins and values of the world’s two biggest religions. Their letter, A Common Word, cited passages from the Koran which the scholars said showed that Christianity and Islam worship the same God, and require their respective followers to show each other particular friendship. The document examined fundamental doctrine and stressed what it said were key similarities – such as the belief in one God and the requirement for believers to “love their neighbours as themselves”. Significantly the letter acknowledged that the Prophet Muhammad was told only the same truths that had already been revealed to Jewish and Christian prophets, including Jesus himself. After a year using the Islamic principle of seeking consensus, the letter has developed into a “manifesto” and is backed by almost 300 leaders from Sunni, Shi’ite, Sufi and other Muslim traditions. 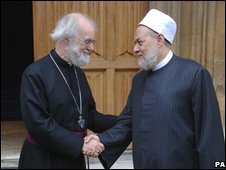 The initiative was welcomed promptly by several Christian leaders, including the Archbishop of Canterbury, Rowan Williams. 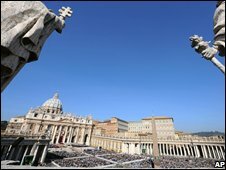 The Vatican has, however, responded more cautiously to the prospect of identifying common beliefs. There has been renewed urgency among Muslim leaders to forge new bonds with Christians since the terrorist attacks of 11 September 2001. A lecture by Pope Benedict quoting a 14th Century Byzantine emperor’s accusation that Muhammad encouraged the use of violence in spreading Islam led to a furious reaction among Muslims and contributed to the sense of a widening gap between the religions. The high-ranking delegation going to Rome includes the Grand Mufti of Bosnia, an Iranian Ayatollah, a Jordanian prince and British converts to Islam. They are also aiming to work out practical measures for resolving crises in Muslim-Christian relations, such as the angry controversy that followed the publication of cartoons of the Prophet Muhammad in Denmark in 2006. Dr Ibrahim Kalin, a Turkish scholar who will be among the Muslims who meet the Pope on Thursday, said the dispute about the cartoons showed how important it was to establish regular dialogue. Some of those behind the Common Word initiative believe it has been too easy for radical or extremist Muslims to use the media to promote a distorted view of Islam. One of their principal aims is to create a body that can speak authoritatively for mainstream Islam. Although the Pope can speak for about a billion Roman Catholics (roughly half of the world’s Christian population), Islam has no central authority able to represent its 1.3 billion faithful. Apart from practical mechanisms to cope with disagreements, the Pope’s Muslim visitors are hoping for a measure of agreement on matters of fundamental belief, and for an exchange of reading-lists – each side providing the names of the books that most accurately describe their values and traditions. They also want to extend the Christian-Muslim conversation to include that other Abrahamic religion, Judaism. The Pope is on record as seeking dialogue with Muslims, and is reported to favour a franker, more robust, approach. He is likely to have his own priorities, including a discussion of religious freedom. It is a sensitive issue, not least because some Muslim-majority countries forbid conversion, and oppress their Christian minorities. Last month a formal meeting of Catholic bishops in Rome said the conversation should stress the need for equal rights for women. Some Islamic states – such as Saudi Arabia – limit women’s rights. Other awkward issues could include the need for democracy. There is plenty that both sides are clear they cannot agree. Muslims regard Jesus as an important prophet, for example, but they do not believe he was crucified. Another of the big differences between the religions centres on how God is understood. Ibrahim Kalin says the Christian belief in Jesus as part of a divine trinity with God the Father and the Holy Spirit conflicts with Muslim doctrine. “The Trinity is currently not accepted by Muslims as explaining the infinity and oneness of God,” said Dr Kalin.